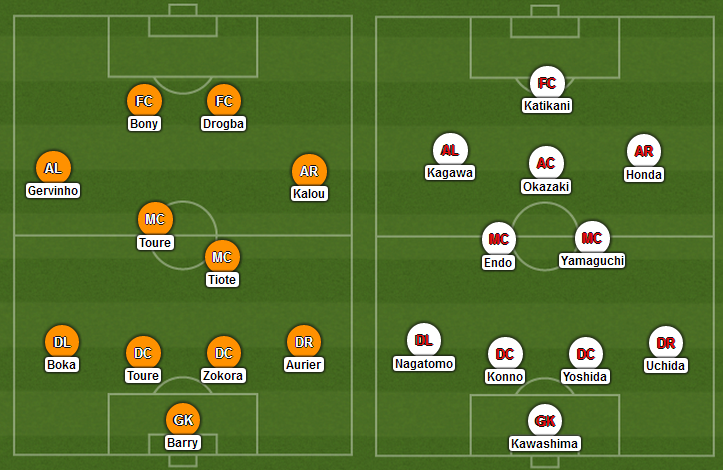 Match Preview: Ivory Coast vs Japan. with possible lineups, form guide head to head, stats, facts, players to watch and prediction. Ivory Coast will play Japan in a late game tonight at Arena Pernambuco. Ivory Coast have never qualified for the knockout stages of the World Cup and a win today will boost their chances. Ivory Coast and Japan both are completely different in style, Ivory Coast have quality players but all are nearly 30 or have crossed it like Didier Drogba, the two Toure. Wilfried Bony is the key striker who can do something different this time. While Japan have a youthful squad who will play a fast game, Japanese also have star players like Shinji Kagawa and Keisuke Honda. Didier Drogba: The 36-year-old striker is still a man to watch in this fixture. The skipper will start alongside Bony who has also proved his goal scoring record last season. Drogba scored 14 goals for Galatasaray last season. Keisuke Honda: The 28-year-old AC Milan attacker is the key man for Japan. Honda has scored 22 goals in 56 games for Japan.